Texas passed a takeback law covering Televisions. (Texas already has a computer takeback law.) Television manufacturers must register with the state, and submit recovery plans for how they will collect, reuse, and recycle their old televisions from consumers. This law introduces the market share collection goals in future years. It also includes the “recycling leadership program” promoted by the Consumer Electronics Association (CEA), whereby TV manufacturers would work collectively, and would provide at least 200 collection sites in the state. Extends existing takeback law (which covered only households) to offer free recycling to schools, non-profits, and small businesses (100 or less employees), but allows collection sites to limit the drop offs to seven or less items at one time. Adds rules for CRT glass processing. On Nov 23, 2010, Governor Ed Rendell of Pennsylvania signed into law a producer responsibility law, which requires manufacturers to have a plan to collect and recycle their old TVs, computer, monitors, laptops, keyboards and mice. On May 29, Governor Patterson of New York signed into law a strong producer responsibility law, which requires the manufacturers to pay for collection and recycling of e-waste from consumers, including individuals, schools, municipalities, small businesses, and small non-profits. The New York law pre-empts the New York City law, so it also renders moot the lawsuit brought by the electronics industry against the City’s law. South Carolina is the 22nd state to pass an e-waste law. On May 19, Governor Mark Sanford signed into law a “mild” producer responsibility law, modeled on “the Dell bill,” similar to those adopted by Texas and Virginia. Governor Jim Douglas signed S.77 into law on April 19, 2010, making Vermont the 21st state to pass a statewide e-waste recycling law. The Vermont program establishes producer responsibility for collecting and recycling e-waste from households, charities, school districts and small business in the state. North Carolina modified its law, adding printers, scanners, and multi-function devices to its scope of products. It clarified that free recycling of covered devices is available to consumers and non profits of less than 10 employees. Indiana was the first state to pass an e-waste law in 2009. Indiana Gov. 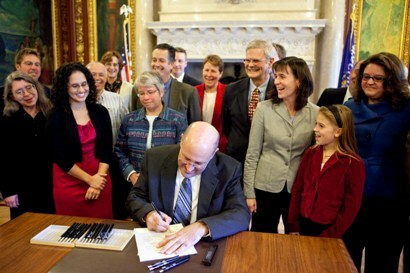 Daniels signed HB1589 into law on May 13, 2009. The IN law is a producer responsibility law modeled on the Minnesota law, setting collection goals based on the manufacturers’ market share. Wisconsin’s Governor Doyle (pictured left) signed SB107 into law on October 23, 2009. Wisconsin is the 20th state to to pass a statewide recycling law. Like Indiana, Wisconsin modeled its bill on the Minnesota law, which sets collection goals based on manufacturer market share. This bill was strongly supported by environmental groups, local governments, and the Associated Recyclers of Wisconsin. Bill sponsor, Senator Mark Miller, was one of the first legislators in the country to introduce a producer responsibility bill for e-waste, back in 2002. Maine: Changed obligation for television manufacturers from return share to market share, expanded scope to include digital picture frames (as a computer monitor), printers, and video game consoles. Added manufacturer registration fee. New York City is the first US city to pass a mandatory producer responsibility ordinance. The law was approved by the New York City Council on Feb 13, 2008. But before sending it to the Mayor, the council split it into two bills. One established the takeback program (Intro 728). The other established mandatory goals for the manufacturers (Intro 729). Both passed the Council. The Mayor signed Int 728, but vetoed the bill with goals (Int 729). The Council voted to override his veto on May 13, 2008. Natural Resources Defence Council (NRDC) was a key advocate for this law. This law has since been pre-empted by the New York State e-waste law, passed in 2010. New Jersey passed the first state e-waste bill in 2008, on Jan 15, 2008. Virginia passed a law on March 11, 2008. It covers computer equipment, but not television. West Virginia’s Governor signed their new e-waste law on April 1. Oklahoma. The Governor signed a takeback law (for computers only) on May 13. Hawaii sent a bill to the Governor (on May 5). The Governor vetoed it, but the legislature overrode it. It calls for computer companies to take back computers, monitors, and printers. It sets up a task force to study recycling for TVs. Illinois passed a takeback bill on July 10, which was signed by the Governor on Sept 17. It is the first “return share” bill with goals in the law. The Environmental Law and Policy Center was a key advocate for this law. Rhode Island passed a return share takeback bill signed into law on June 27. Clean Water Action New England was a key advocate for this law. North Carolina added TVs to their e-waste program in a law signed by the Governor on August 9, 2008. Michigan passed a Dell-bill, which was signed by the Governor on Dec 26, 2008. New Hampshire passed a study bill. The law creates a commission to study the issue by December 1, 2008. For from 2004 – 2008, a coalition of TV companies lobbied against producer responsibility bills, instead promoting bills (like California’s) where consumers pay fees at purchase (Advanced Recycling Fees) instead of making the companies accept responsibility. This coalition, called the Electronics Manufacturers’ Coalition for Responsible Recycling (EMCRR), was led by Sharp, Panasonic, and Philips. This group of companies has officially dissolved. Many large companies, including Sony, Samsing, LG, Toshiba and IBM had already quit the coalition in 2007. Despite their efforts, no other state after California adopted their consumer fee approach. The next 16 states passed producer responsibility laws, and ARF legislation is rarely introduced any longer. This dissolution came less than 2 weeks after Sharp sent letters to the Massachusetts legislature (opposing a producer responsibility bill), in the names of the EMCRR coalition, including the companies who had withdrawn.